BEST OF EC COMICS ARTIST’S EDITION Coming in June From IDW! San Diego, CA (February 15, 2013) – IDW Publishing is proud to announce an Artist’s Edition like no other—The Best of EC COMICS Artist’s Edition, Volume One. This massive book will measure 15″ x 22″, the same size as both the Wally Wood and MAD Artist’s Editions, and will contain stellar works by Al Williamson, Harvey Kurtzman, Bernie Krigstein, Johnny Craig, and others. Additionally, there will be an art gallery of classic covers—including the peerless Weird Science-Fantasy #29 by Frank Frazetta. EC Comics was arguably the greatest publishing entity in the history of comic books. For a five-year stretch in the early 1950s they set the bar higher than ever before, and with a level of consistency unmatched. In the early 1980s the original art for all EC stories was auctioned off and most of these have been buried in collections since that time, rarely being seen by anyone except the original art’s owners. What is an Artist’s Edition? Artist’s Editions are printed the same size as the original art. While appearing to be in black & white, each page has been scanned in COLOR to mimic as closely as possible the experience of viewing the actual original art—for example, you are able to clearly see paste-overs, blue pencils in the art, editorial notes, art corrections. Each page is printed the same size as drawn, and the paper selected is as close as possible to the original art board. Previous Artist’s Editions include DAVE STEVENS’ THE ROCKETEER: ARTIST’S EDITION and WALTER SIMONSON’S THE MIGHTY THOR: ARTIST’S EDITION, JOHN ROMITA’S THE AMAZING SPIDER-MAN: ARTIST’S EDITION, WALLY WOOD’S EC STORIES: THE ARTIST’S EDITION, SERGIO ARAGONES’ GROO THE WANDERER: ARTIST’S EDITION, AND DAVID MAZZUCCHELLI’S DAREDEVIL: BORN AGAIN ARTIST’S EDITION. The ROCKETEER ARTIST’S EDITION won two Eisner Awards in 2011, for Best Archival Project and Best Design and THE MIGHTY THOR: ARTIST’S EDITION won the 2012 Eisner Award for Best Archival Project. 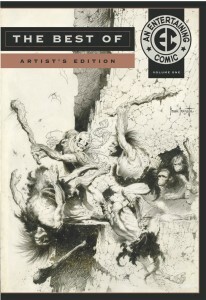 THE BEST OF EC COMICS ARTIST’S EDITION, VOLUME 1 (HC, B&W, 160 pgs., $95). In stores 6/19/13. This entry was posted in Columns and tagged al williamson, bernie krigstein, ec comics, frank franzetta, harvey kurtzman, idw, johnny craig, mad artists, The Best of EC COMICS Artist's Edition, Volume One, wally wood. Bookmark the permalink. Follow any comments here with the RSS feed for this post. Post a comment or leave a trackback: Trackback URL.